The head resembles a smooth, blunt wedge from a front or profile view. When seen from the front, the head widens gradually towards the base of the ears in an unbroken line and is well filled up under the eyes. The expression is intelligent, alert and full of interest. The eyes are not large. They are obliquely set wide apart and are oval in shape. Eye color varies with coat color from darkest brown to hazel. Eye rim pigmentation corresponds with nose color and facial markings. Gray eyes are acceptable in blue or blue-fawn dogs only, being a serious fault in other colorations. Any blue in the eye(s) is a disqualification. Ears - Set on the top outer edge of the skull, V-shaped, with the length in proportion to the head moderately pointed at the tip. When viewed from the side, the base of the ear is on line with the outer corner of the eye. Ears should match in shape and carriage when alert, and can be carried erect, semi-erect and tipped, or button without preference. When alert, a rose ear is a fault. Cropped ears are a disqualification. Skull -When viewed from the front the skull is moderate in width, relatively flat on top, and rounded at crown and the sides as it widens smoothly from the corner of the eyes to the base of the ears. The occiput is not prominent. The cheeks are flat and well-muscled, but never bulging. The stop is moderate but distinct. The muzzle is strong, just slightly shorter in length than the skull and tapers smoothly along the sides to the nose. The nose color corresponds with the body color and is entirely pigmented. Flesh-colored noses are considered a fault in lemon or light apricot colorations while being a serious fault in other colorations. Seasonal fading is permitted. The lips are clean and tight, and correspond in color with the nose leather or may be pink; either solid or spotted is acceptable. The lower jaw and teeth are strong and well developed with no sign of being snipey or weak. Bite- A scissor bite is preferred. A level bite is acceptable. Click Here to Learn about breeder background checks on Rat Terrier breeders if you are looking for puppies for sale. Click Here to learn how ResearchBreeder.com can help you find healthy Rat Terrier puppies for sale. puppies for sale. Click Here to order a Breeder or Kennel Background Check on Rat Terrier Breeders that may have puppies for sale. 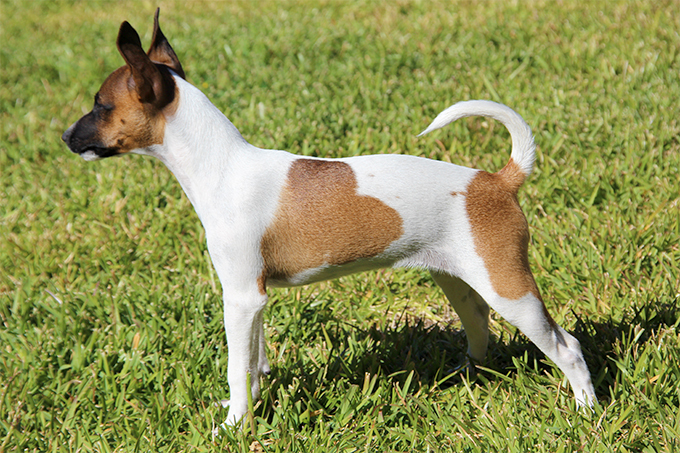 Click here to find the national Rat Terrier breed club for puppies for sale. Click Here to purchase a list of approved ResearchBreeder.com Rat Terrier Breeders who have puppies for sale.